Glossier is a unicorn in the beauty market and there’s no other way to put it. This direct to consumer (D2C or DNVB) has scaled tremendous heights in terms of engagement and following. The sought-after and celebrated cosmetics company originally started off in 2010 as a beauty blog called IntotheGloss.com written by Emily Weiss, a former styling assistant for Vogue. The skincare and makeup brand was born when Weiss had a hunch that there was a huge gap between what the beauty industry offered and the beauty needs of real-life women. In 2014, Glossier was launched online with four products and in just four years, it has grown into a cult-status, multi-million dollar business. Glossier’s success is no secret sauce hidden away in vaults; it’s pillared on two things – social media and branding. From transforming a beauty blog into a digital marketing machine, Glossier is a classic example of a successful content to commerce leap. This Glossier social media report was put together using Unmetric Analyze. It listens to over 100,000 brands to help our clients create more engaging content, get more certainty around their social strategy and automate their reporting. No amount of Glossier’s success can be talked about without giving due credit to its predecessor Into The Gloss (ITG) and it’s leader Emily Weiss. The beauty, fashion and all-round lifestyle blog now functions as an editorial platform for Glossier’s content and has played a phenomenal part in cementing the brand’s authority and niche status. According to Weiss, the blog and its digital presence has been their “single largest social media platform”. 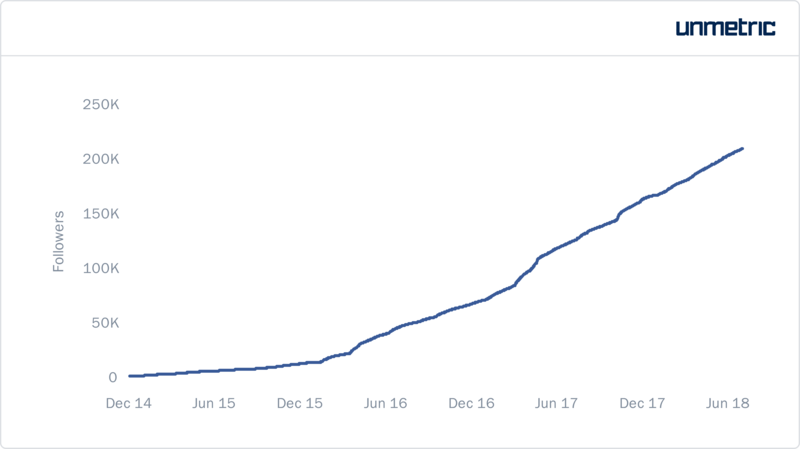 ITG today has a combined following of over 936K on social media channels like Facebook, Twitter, Instagram and more than 145K subscribers on YouTube. When Glossier was on the launch pad, Into The Gloss had an established presence on social media platforms. For instance, the beauty blog had over 184K followers on Instagram when Glossier was launched. Combined with Weiss’s popularity, they were able to create a huge hype for the launch which helped it acquire over 13K followers on Instagram within a week of it being rolled out in the market! Posts announcing Glossier’s launch on the Instagram handle of Into The Gloss. “We’re not going to make a commercial with wind-billowing satin, like a unicorn whispering luxury,” says Weiss distancing her brand from the usual tropes of advertising in the beauty industry. Glossier’s personality is like the millennial who uses their products – no ultra-expensive photoshoots with supermodels, but iPhone photos and boomerangs. Their signature shade of washed out pink that’s now known as Glossier pink, the images of diverse women, the minimal makeup looks and dewy skin, the millennial voice – altogether has built the brand Glossier. The feminine aesthetic and the celebration of natural beauty have made them a social media phenomenon, with Forbes calling them the “beauty brand for Generation Instagram”. Glossier is ultimately the tongue-in-cheek, cool girl of social media who is authentic unlike many of their peers from beauty industry. Glossier has been successful in marketing the idea that beauty and makeup are everyday things and hence should be affordable to everyone and easy to use. They tapped into the whitespace in the beauty industry and was built on the information and feedback collected from real people who cared about beauty and makeup. Everything from their product to packaging is a result of crowd-sourced feedback and listening. Hence Glossier has been able to establish themselves as not just another cosmetics company, but as a “socially-driven beauty brand”. After finding that people who read Into the Gloss are 40 percent more likely to purchase products than people who just visit Glossier’s website. So, Glossier invested in creating content that was in sync with their products. Glossier’s consumers buy their products and photograph them or photograph them using it and share them on social media. Glossier produced products that are instagrammable, from the pastel-colored products to cute stickers that come free with products, every aspect of their brand is shareable content. Every product is thus an opportunity for more social media engagement. Glossier is relatable AF, if the brand’s winning strategy needs to be defined in brief. Glossier speaks to their target audience unlike most other beauty brands out there through humanized content. Unmetric defines humanized content as something that’s not particularly relevant to the brand, doesn’t include any branding, but has a strong resonance with the audience it is being shared with. From memes to GIFs to relatable quotes, cute animal pictures, and videos and internet hashtags, everything that is part of today’s social media culture has been used by Glossier as content. If you want to effectively communicate with your target audience, be one among them. Glossier has branded themselves around their consumers or the ‘Glossier Girls’. Gone are those days when sharing your beauty regime was a big no-no. Glossier tapped into Instagram’s community of beauty enthusiasts and converted them into the brand’s ambassadors. They frequently re-posted user-generated content which gave fans more incentive to share their Glossier stories online. User-generated pictures and videos and even user conversations made it to Glossier’s social media pages. They encouraged users to use brand hashtags which in turn allowed ordinary users to be discovered and featured on Glossier’s page. It’s great to be endorsed by celebrities, but Glossier works on the mantra that every single consumer and even your employee is an influencer. Glossier relies on their brand loyalists and the community of bloggers and vloggers most of whom also happens to have a small but dedicated following. Glossier has referral programs that offer discounts to people who refer the brand on social media and also sends freebies to influencers and brand loyalists even before the products are launched. As a result, products have a buzz before their releases. The reviews and Instagram posts creates a cycle of advocacy and expands the fan-base. It is not just important to tend to customer queries on dedicated channels, but use your social media as a two-way conversation space than just as a promotional tool. 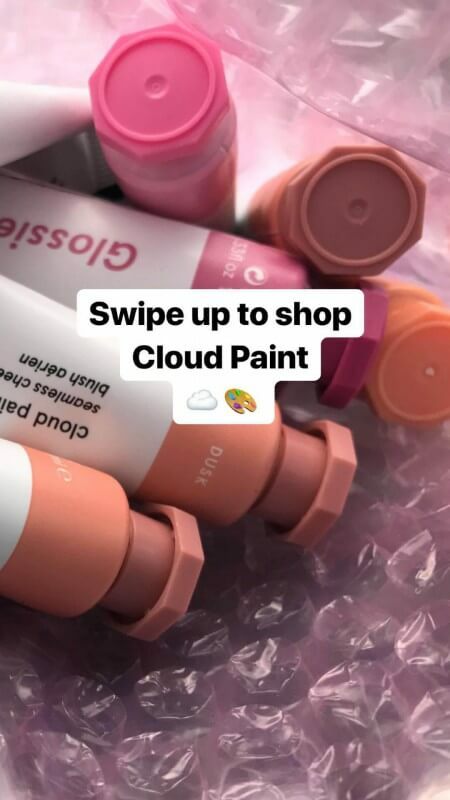 Glossier doesn’t just respond to customers on Twitter, they actively listen to customer conversations on Instagram, even using them to shape their products. Consumers like to be seen and heard and Glossier included consumers to be part of the product’s journey. This personalized the buyer’s journey because users now found value in purchasing the products and associating with the brand. Glossier’s Beyonce stunt has gone down in history, at least for the beauty aficionados. Rather than a regular Instagram reveal or a high-end promotional ad with an influencer, Glossier got Beyonce to wear a mystery product and pose for a photo which was shared on their Instagram handle. This suspense made the internet take notice and got everyone talking. Glossier has already set the scene during Grammys when fans on the internet indulged in a guessing game of what Glossier products Beyonce had worn. The brand waited it out for Oscars to officially launch the product the on red carpet, getting five more celebrities to wear it. This sort of smart, hype-inducing marketing worked wonders for the brand. Social media is not just a platform for promotion and marketing, it can be a ripe platform for research and development. Glossier utilized social media as their R&D lab to listen to consumers, strategize content that resonated and to expand their audience size. They even used social media metrics and data to fuel product development. Glossier has famously used simple engagement metrics such as likes and comments to choose the packaging and design of their products! Now we know how Glossier does their social, let’s look at the numbers behind how well they are doing. Glossier has been born and bred in the digital universe. Hence, the brand has a presence on all major social channels like Facebook, Instagram, Twitter, YouTube, Snapchat, Tumblr, Pinterest, and LinkedIn. Despite its availability in only limited locations like US, Canada, UK and France etc, the brand has been able to create conversations throughout the world among makeup and beauty enthusiasts. Here’s are some big takeaways we got from looking at their Facebook, Instagram, and Twitter. We studied Glossier’s online activity for Facebook, Twitter and Instagram for the period from January 01, 2018 to June 30, 2018 and here are our findings. Glossier has over 210K followers on Facebook, with the brand seeing an addition of 42K fans in the first half of 2018, a 25.2% growth in fans. Since its much-anticipated launch in October 2014, the brand has seen a considerable growth in its Facebook community from 14K fans by the end of 2014 to 168K fans by the end of 2017. In just the first half of 2018, Glossier posted a staggering 832 posts, a number that has seen consistent growth over the years. The brand posted 436 times in 2015 with the number almost doubling to 825 in 2016 to 1353 in 2017. The brand posted 185 photos, 125 videos and 522 links, most of it being links to intothegloss.com and other beauty magazines featuring Glossier products or reviews. Posts with photos engaged the most even though posts with links were more frequent. The photos received over 73K interactions in total while the videos garnered over 1M views. Overall, all the posts types combined had over 138K interactions and an estimated reach of 14.3 M.
This post got the highest engagement with 13.3K interactions. Glossier promoted just 20 posts i.e. a meager 2.4% of the 832 posts. Of the promoted content, 10 of them were photos, 6 were videos and the rest were links. The promoted posts saw great engagement and were among the top performing brand posts. It is interesting that 10 of the 20 posts promoted featured humanized content that had no references to the brand. Glossier’s brand world cloud indicates that they are one-stop-destination for all your skincare and makeup needs. Glossier prefers to talk about general issues and concerns related to beauty and makeup rather than just a product focused approach. 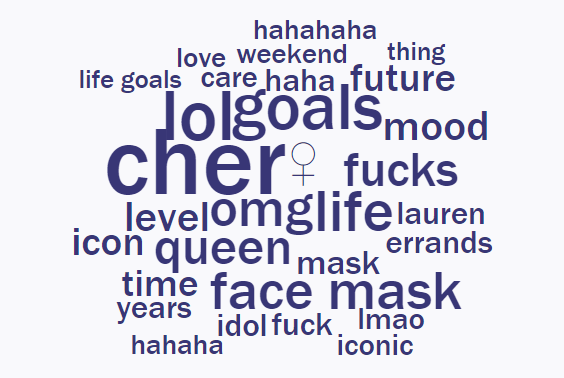 We analyzed the comment word cloud of the most engaging post with 2.6K comments and we find that Glossier’s brand messaging aligns with their consumers. Fans engaged with the relatable post by tagging their friends. Glossier responded to 5.8% of the comments generated by the 832 posts they published i.e 48 conversations in the time period. User sentiment analysis shows that the brand received more positive than negative vibes from Facebook user comments. Glossier posted between 8 AM to 11 PM (EST) with the frequency peaking from 2 PM to 6 PM. Posts engaged between 8 AM and 11 PM, with the highest engagement peaks at 8 AM and 11 AM. The brand maintains a consistent posting frequency by posting on all days of the week with over 100 posts on average on all days of the week. Saturdays saw the highest engagement on posts. From 32K fans in Nov 2014 to over 1.3M fans today, Glossier has grown phenomenally and is a quintessential insta-famous brand. In the first half of 2018 alone, they gained more than 406 K fans, registering a 37.6% growth in followers! Glossier posted 283 posts, a number which is low in comparison to their frequency of posting on Facebook. The posts garnered over 9M likes and more than 105K comments, meaning each post received an average of 34K interactions. Photos made up 90% (257 posts ) of the published content and the videos accounted for 5.5M views. Glossier got a higher engagement of 36K on the brand posts compared to an engagement of 518 for the median Higher personal care brand’s Instagram account from North America. Chicago: we're coming to town this summer! Glossier used hashtags sparingly in the time period analyzed. In fact even though Glossier used 15 different hashtags during the time period analyzed, more than 92% of the posts did not contain any hashtag. Only two of the hashtags used were product hashtags while the rest were non-branded hashtags. We looked at the hashtags Glossier used since its inception in October 2014 and noticed that Glossier has cut down on the brand hashtags they used over the years. But, Instagram is flooded with Glossier hashtags like #glossier, #cloudpaint, #boybrow, #nofilterjustglossier, #glossierpink. For instance, brand hashtag #Glossier has got 236K results on Instagram, while #glossierpink has over 17K posts! Glossier goes an extra mile with their clever marketing strategy and released their new products on major red carpet events. The brand e Glossier launched their new product during the Oscars 2018 under two hashtags #oscars and #gloscars. The four brand posts received over 108K interactions (likes and comments) and more than 505K video views. Glossier is a brand that is built on customer feedback and it’s no surprise that they use this functionality of Twitter for building an effective relationship with the consumer. 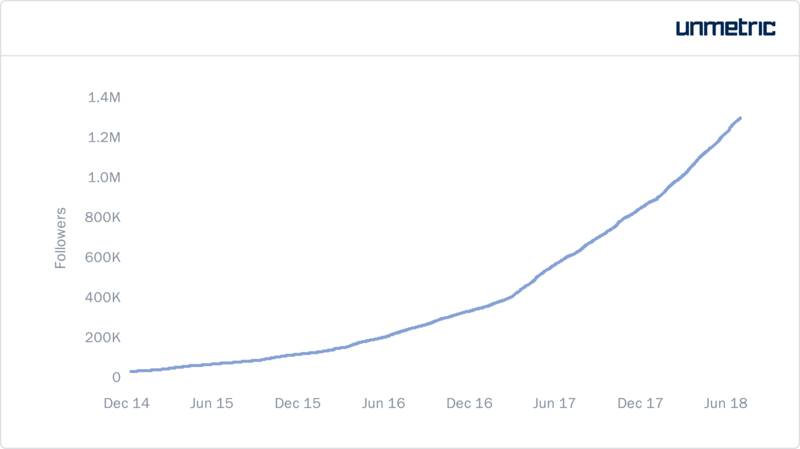 Glossier has over 64K followers on Twitter and added over 15K new followers in the given time period, registering a 30.5% growth in followers. Glossier tweeted 2007 times. On average, @glossier sent 11 Tweets per day. 66% of their Twitter content involves replies to customers and only 28% include proactive tweets from the brand. Glossier tweeted the most on Tuesdays while Wednesdays had the most engagement. 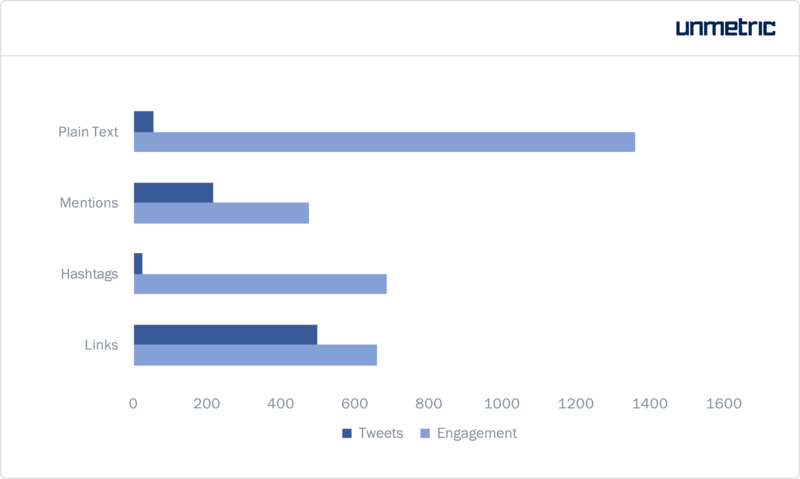 In terms of timing, 9 AM to 12 PM had the most number of tweets, while the best engagement window was between 6 AM to 9 AM. Glossier had a high response rate of 5.4% from 22K user mentions. Requesting the user to direct message them is the most frequent brand reply. The brand also responds to any product related queries and concerns. An analysis of the sentiment of tweets to which the brand has replied to, shows that 87% of them are neutral and 12% are positive. 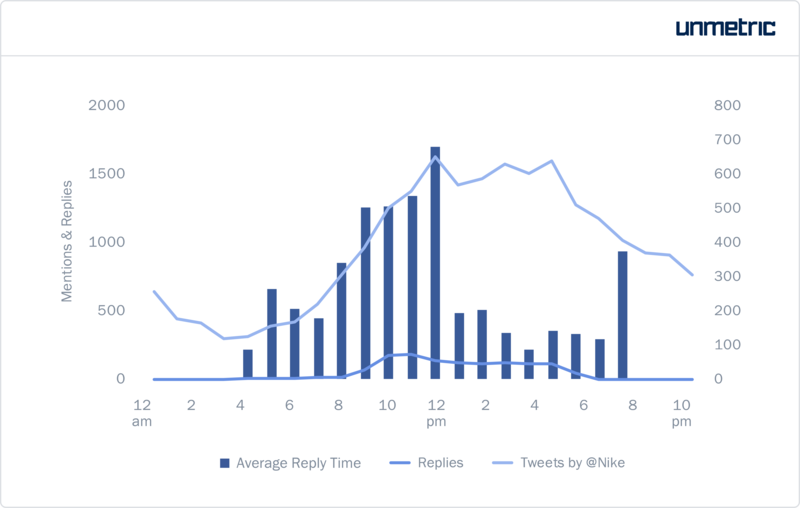 On average Glossier replied to a tweet in 5.5 hours, with 35% of the user tweets being responded to in 1 – 6 hours. Having a direct relationship with customers is the golden rule to brand Glossier. Twitter and Instagram are favored channels as the brand actively listens to and responds to their fans. The biggest reason why Glossier shines in customer service is their relatable voice. Glossier is like someone from your girl gang or friend you go to for reliable beauty advice. The song is TTYL by Mirabeza Tobacco. We’ll be launching in Quebec this year! Stay tuned for more details. If you are a fan favorite like Glossier, you are part of a lot of conversations on Twitter. Glossier had over 22K mentions in the time period. The brand is featured not just in user tweets, but also mentioned by fashion magazines and journals. The brand has been frequently mentioned by fashion and lifestyle magazines such as British Vogue, InStyle, The Cut, Fashionista.com, Stylist Magazine, Allure etc. Glossier is also @-mentioned by a number of influencers on Twitter. This includes actors, models and Youtubers with over a million following to micro influencers like beauty bloggers with an audience of a few hundreds or thousands. thoughts on the @glossier serums? Here are the main content types that are found in Glossier’s social media profiles. Memes and relatable humour is a big hit with Glossier’s audience getting the highest engagement. Memes aren’t necessarily product related, but speaks to their millennial audience. Glossier has such a dedicated following that users regularly share tweets or funny Glossier references that the brand reposts on their social. Glossier releases products every six weeks or so. This provides a ripe opportunity for the brand to tease product launches and other product focused content. They also post about their pop-up shops and other promotional events. Glossier regularly shares content that features, Emily Weiss, the brand’s most public icon. Weiss and Glossier are closely intertwined and her persona as a beauty industry disruptor and thought leader adds more credibility to the brand. Glossier also shares the extensive coverage they get from media and other beauty magazines. Glossier is not just pushing out product promotions on social media, the brand taps into its association with Into The Gloss and publishes relevant content. Glossier frequently shares links to ITG and other beauty, lifestyle blogs on Facebook and Twitter. Relevant articles related to beauty, skin care and lifestyle are shared to their audience. Glossier sells an aesthetic on their social media especially on Instagram -artsy posts featuring products or even just their colors! Minimalistic and instagram-worthy Glossier pink branding and the pastel hues makes makes it easy for anyone to confuse Glossier’s page with an art page. The brand’s now recognisable aesthetic has lead to users associating the signature pink seen in their everyday lives with the brand and even creating a custom hashtag for it! 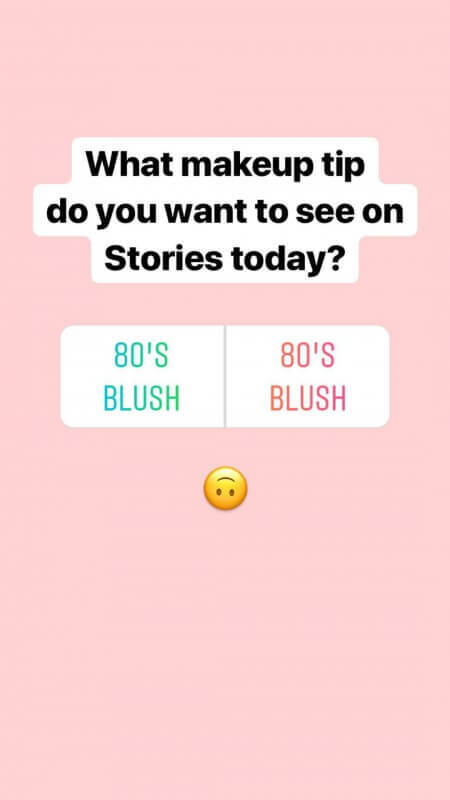 Glossier is big on Instagram stories. Glossier uses stories as a place to demo products, offer tips on how to wear each product, and feature their users wearing their products. Glossier’s Instagram photos and videos are not professional, unlike other brands on the scene. The tone is casual and intimate and makes the content feel like it’s directly coming from a friend. Social media has played a phenomenal role in building Glossier and its cult-status, if you think your brand needs to revamp their social strategy and connect the dots within the data, sign up to Analyze, Unmetric’s competitive intelligence solution for brands. This report was put together using Unmetric Analyze. It listens to what over 100,000 brands are saying on social media and understands how the audience is reacting to that. Clients use Unmetric to help them create better content, get more certainty around their social media strategy and automate all their reporting. Pricing starts at $1,000 per month.